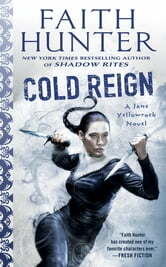 Jane Yellowrock is a shape-shifting skinwalker...and the woman rogue vampires fear most. Amazing Ride Through Yellowrock World! Anyone who reads urban fantasy looks for action somewhere in the story right? In Cold Reign, the story takes off like a shot and keeps the reader on an emotional roller coaster, stone skipping from one crisis to the next! There is amazing action and attention to details that keep the reader's disbelief in suspension. Faith Hunter's style is direct, mature and riveting to read. This book will knock you off your feet or seat depending on whether you're standing or sitting and I highly recommend it. The characters are rich, grow with the series and best of all, can be read by all ages and still pack an exciting wallop. Jane & the Yellowrock Clan are constantly battling on several fronts at once, but as a team it all comes together in the end. The more Jane learns about herself the more things change. Can hardly wait for the next installment in the series & it promises to be intense & action filled. Oh my God I adore the character progression of Jane ane the others with her. They all grow and it's great to see. She was quite one dimensional in the beginning but now she's a powerhouse and is nobody's fool. Yassssss queen!